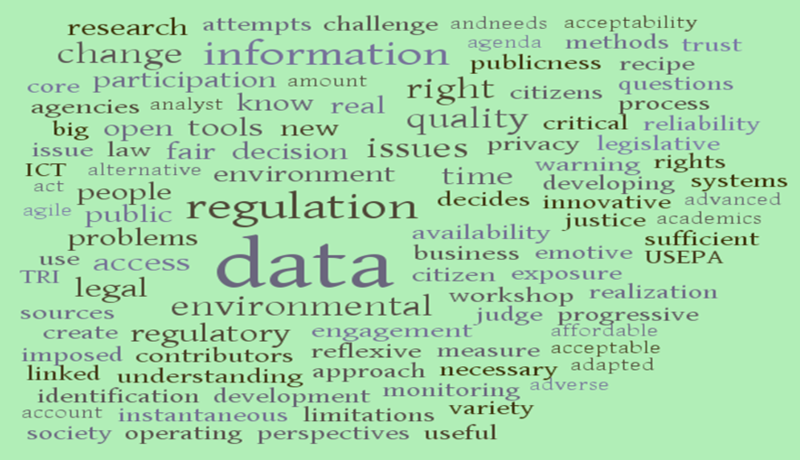 A word cloud based on the rapporteurs’ reports from our workshop in June 2013. This site is for those who are interested in the application of information and communications technology for environmental regulation. From online booksellers highlighting interesting items, social networking sites encouraging users to divulge personal information and auction sites using reputation-based systems to reassure consumers when entering into transactions with strangers, computers can, and do, change human behaviour and have changed society in dramatic ways. While there is some research on how ICT can be used for environmental regulation, we have not yet developed a full understanding of the issues. As society considers how to deal with the challenges of climate change, loss of biodiversity and environmental degradation generally, the continuing implementation of more refined and effective means of environmental regulation requires urgent attention. ICT has an important role in this process and this website aims to build a global network of researchers dealing with these issues. Our principal activity to date has been the workshop “Information and Communications Technology for Environmental Regulation: Developing a Research Agenda” in June 2013 at the National University of Ireland Galway. We also have a LinkedIn group. We also organised a panel on Using ICT for environmental regulation. Overlaps between privacy and environmental law at Computers, Privacy and Data Protection 2015, and a workshop on Blockchain and Sustainable Communities in 2016. Good to see this up and running! Thank you Rónán for putting so much effort into getting this up and running. The podcast facilities and access to presentation slides provides a very valuable information respository. Looking forward to contributing further. Congratulations on this important initiative. I am pleased to report that the satellite survey of exposed peatlands that UCC did for us in 2010 has now been used by the Department of the Environment to select 126 sites of more than 30 hectares where we believe industrial extraction is taking place. (Local authorities hold no records as until recently it did not require planning permission.) They have provided pdf maps of the sites to the 20 local authorities involved this summer with a questionaire as to the activities taking place. We will be meeting with the Department again this autumn and at that stage will hopefully be able to produce a report of the value of this work for this site.